It is a near-constant spectacle on Allston’s Cambridge Street overpass, one that residents joke is akin to “Frogger,” the video game with lime green amphibians that dodge speeding cars while crossing the street. Very few pedestrians make the trek to designated crosswalks at either end of the overpass. For people traveling between North Allston and Allston Village, reaching a crosswalk requires a one-third mile diversion in either direction. Most prefer to take the direct route and jaywalk — or jayrun . Some scurry, waiting for gaps in traffic to reach the opposite side of the overpass that straddles the Massachusetts Turnpike. At other points, they hop a jersey barrier, then jog to the median, braving cars that approach at near-highway speeds. Now, residents are calling for change. They are scheduled to meet with Massachusetts Department of Transportation representatives at 6 p.m. Tuesday at Jackson Mann Community Center to continue their campaign for better pedestrian access as the agency embarks on a two-year, $10 million bridge deck replacement project. They want a crosswalk signal in the middle of the overpass, and they just might get one. In a reversal of their previous stance, MassDOT officials said Monday they would consider installing a pedestrian crossing that, for months, they maintained would be an engineering quagmire. But residents said they also want the transportation department to right a historical wrong, improving an intersection that they say is not only dangerous, but also further isolates North Allston, a community cut off since the arrival of the turnpike in the 1960s. The median strip at the Cambridge Street overpass in Allston is uneven, adding to the unsafe conditions that pedestrians face. The overpass is a nexus of foot traffic. It connects with a pedestrian-only bridge that crosses the Mass. Pike and a staircase leading up from North Allston. There is also a stop on one of the MBTA’s most-traveled bus lines, the 66. During the deck reconstruction, scheduled to conclude in 2016, the overpass will go from three car lanes to two in order to accommodate new buffered bike lanes, and a fence will be erected in the median to discourage jaywalking. In the past, MassDOT officials told community activists that a crosswalk would not be feasible because it would be difficult for cars to see the crossing from a distance. Last week, MassDOT spokesman Mike Verseckes said the agency had heard residents’ complaints, but had no plans for a crossing. 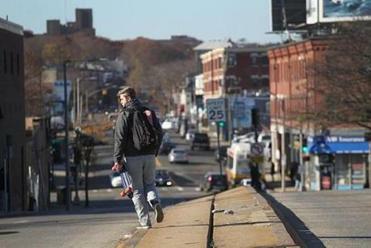 But on Monday, Verseckes said planning officials have further weighed community concerns, and are now considering installing a crosswalk at the top of the overpass, near the staircase leading to North Allston, and may also erect an overhead warning system to alert cars they are approaching a crosswalk. Still, he said, the overpass can’t wait much longer for repairs. The deck and substructure are rated in poor condition. And a hole in the sidewalk has meant that the sidewalk had to be diverted with jersey barriers until it can be fixed. But that’s not enough, residents said. They point to the Healthy Transportation Policy Directive, which the state transportation agency adopted two months ago. It is meant to prevent officials from simply dusting off outdated design plans from years ago for construction projects that have long awaited the money to become reality. Instead, the directive orders project managers to take a fresh look at all scheduled projects, making sure they incorporate more sustainable forms of transportation such as walking, biking, and public transit. Allston residents said they believe the project could have a more positive impact on the lives of residents if MassDOT took more time. They are pushing for the deck construction to be delayed, and carried out in conjunction with a larger, better-funded undertaking to straighten the Allston stretch of the Massachusetts Turnpike. Ultimately, residents said they want the overpass to lose its quasi-highway feel, and become a more hospitable thoroughfare that knits together the two parts of Allston. That would mean more crossings, a lower speed limit, a less steep overpass that is closer to the level of surrounding streets, and an end to the chain-link fence that obscures a picturesque view of downtown Boston.